On the Excel Blackbelts forum, someone asked a very interesting question about how to analyze relationships between customers and products. The question was how to create a heatmap of associated products, starting from a list of pairs of customer and product number. 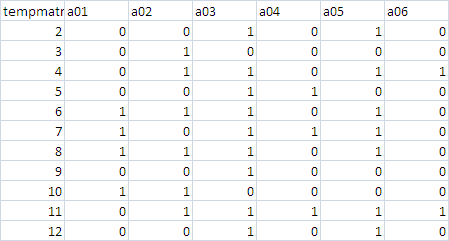 At first this seemed like a job for some combination of array formulas involving countifs, sumproduct, but the user also said that the input data could be 100000 rows with as many as 30 products. This seemed intuitively too big for an array formula solution, so I pressed ahead with a VBA solution using the Data Manipulation Classes to speed up development. Why not array formula ? 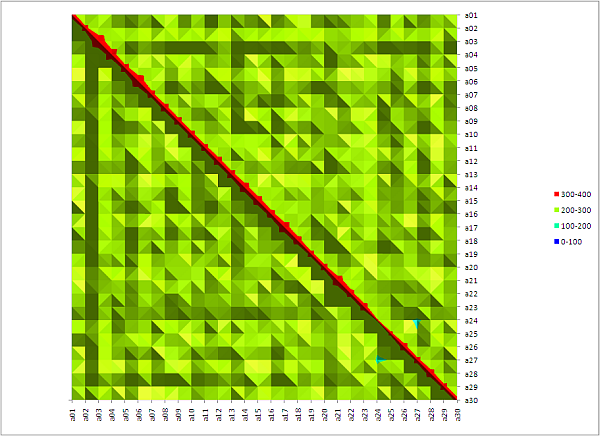 The first problem was generating enough random valid test data. Here's how. It's not great data, since with a sample this size, most cells will end up about even by chance - but the main thing is it gives me volume. In the screenshots following, I'm only looking at the first 10,000 rows for the sake of speed. If you are playing around with this downloaded sheet, I suggest you set calculation to manual. If you run the example it will do that anyway. Next we'll apply heatmapping ramp formats to that table. 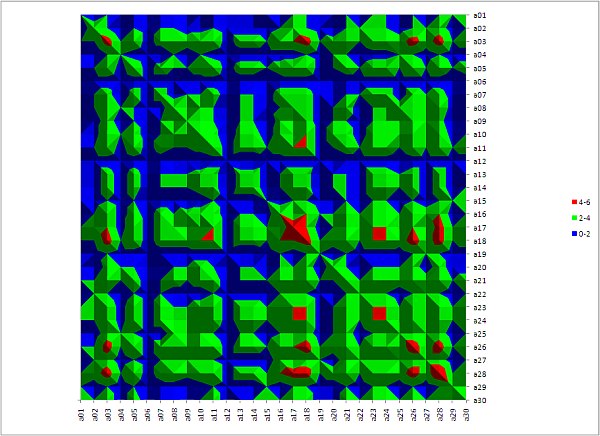 and lets do a couple of heatmap chart as well. 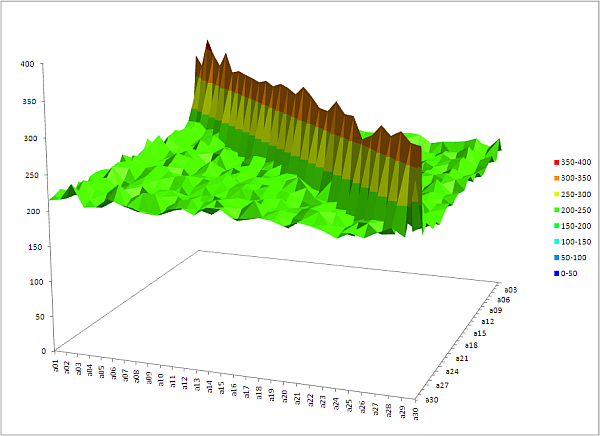 Using Automatic Profiling tools which you can download on this website I ran various scenarios from 100 to 50,000 rows. Here are the calculation times in seconds. 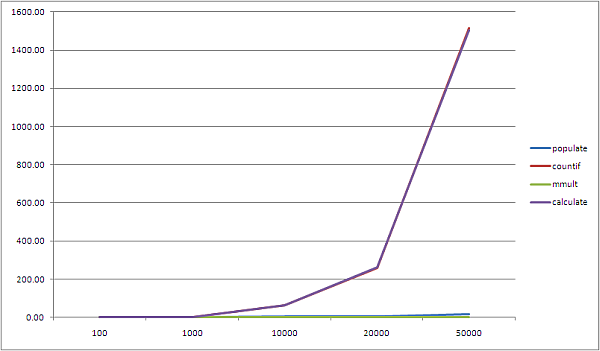 I didn't even bother with 100,000 and you can see why from the graph below. Whereas you can create a very elegant solution using array formulas, they quickly run out of steam. In the case of this example, the exponential nature of the execution time means you need to consider very carefully the final data set size when implementing. This article referenced a number of other items on this site such as Data Manipulation Classes , Automatic Profiling and Create a heatmap in Excel. You can download everything at Download Complete Projects. See also Optimizing the array formula for how to mitigate some of these problems. This example is contained in the arrayFormulas.xlsm workbook. Why not join our forum, follow the blog or follow me on twitter to ensure you get updates when they are available. You can also submit anything you want considered for publication on this site to our forum.